And when she talks about her daughters, she can’t help but tear up with emotion and needs to pause to get her thoughts together. As a child, Terri grew up on a potato farm in rural Michigan before her parents sold the property to the Frito Lay company. She started her own potato farm in Molokai, Hawaii, but when that didn’t work she followed her family to Florida where she fell into the conch life in Key West quite easily. Terri’s mother landed a position as the director of nurses at DePoo Hospital and her dad found work at Charley Toppino & Sons, a local general contracting, site specialist and demolition service. Terri also changed careers. At age 30 she got her start in the hospitality industry at Perry’s Restaurant of the Keys before it became Wreckers Bar & Grill. What once was a string of seafood restaurants is now an abandoned building on Roosevelt Boulevard in the vicinity of recently-built boutique hotels. Driving by, it’s hard to imagine what the place must have looked like when Terri worked there. Despite her longevity in Key West, Terri has held only three jobs here. Her second job at Rusty Anchor on Stock Island lasted an impressive 20 years. 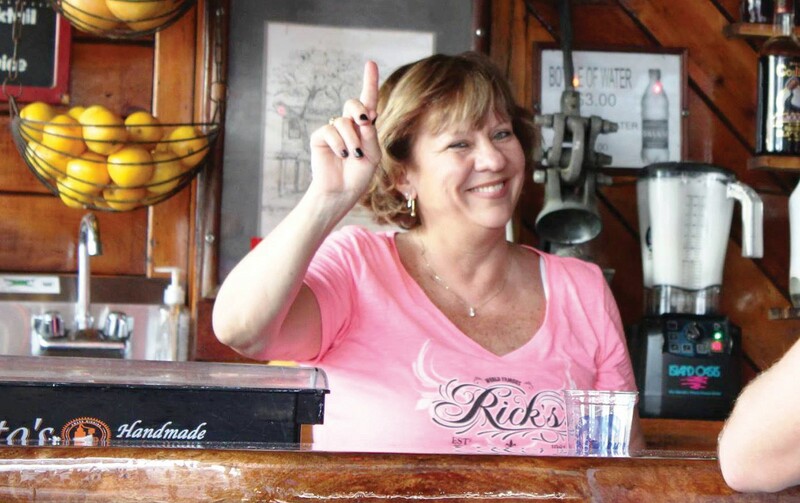 Then 2½ years ago, Terri was hired at the most popular people-watching bar in the 200 block of Duval Street, the Tree Bar at Rick’s. The Tree Bar is a place where bartenders stay for a very long time and positions rarely come open. The little outdoor corner bar adjacent to the sidewalk boasts one of the best mixes of vodka, Clamato, tomato juice, horseradish, Worcestershire and hot sauce on this side of town, if not in the entire Florida Keys. It’s been voted as such among the community and there is even a plaque on the bar wall declaring it as being the best in the world. The Tree Bar is also known for its freshly squeezed — or as the sign above the register says, freshly squeezed — juice cocktails that they make right in front of the patrons with a commercial grade manual juicer. Terri herself is a fan of a classic made to order greyhound. (The spelling on the sign was deliberately never fixed and is kept as a Rick’s inside joke since most customers are completely oblivious to it). Although she describes herself as an “old school bartender” who can make a mean martini or Manhattan, she says that she isn’t so much into the craft cocktail or mixology scene and prefers to entertain with good conversation instead. “I’m a talker,” she admits. A MUST – visit with her while in KW! YAY, we are fellow Michiganders and now Florida residents!